1. Add salt, black pepper, ginger paste, chopped green onion & egg into ground pork. Mix well. 2. Heat up a pan with medium heat, lightly grease with oil. Grease a heart shape mould and place it on top of the pan. Fill the ground pork mixture into the mould and fry until cooked and golden brown. Repeat until you’ve use up all the ground pork mixture. Dish up and set aside. 3. Salsa: Chopped the coriander, cut the cherry tomatoes & onion into small dice. Mix well with soy sauce, salt & black pepper. Set aside. 4. To serve: Use a bamboo skewer to hold the heart shape cooked ground pork. 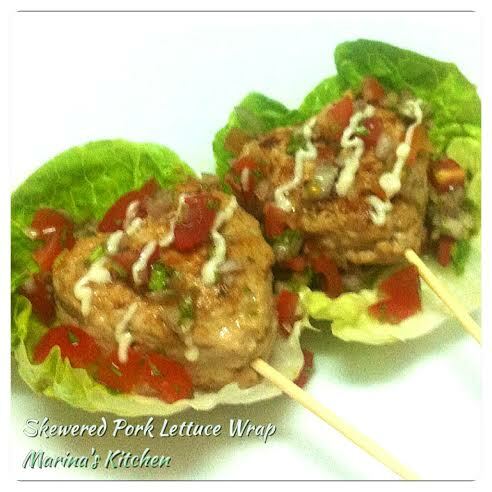 Garnish with salsa, roman lettuce & mayonnaise. Serve.